This article discusses a tennis service ball toss. ​ ​A tennis service is used to start each point in a game. Tennis players alternate being the server for each new game played. Players usually spin racquets or use a coin toss to decide which player will serve the first game. One player or team is given a chance to predict the outcome of a coin toss. Normally, a two-headed coin coin is tossed into the air and allowed to drop to the ground. The choices are heads or tails. The winner of the coin toss gets to decide between being the server or the receiver during the first game. The other player or team is usually offered a choice of which side of the tennis net they want to be on for the first point of the first game. One player or team is given a chance to predict the outcome of a racquet spin. Normally, one player spins a loosely gripped tennis racquet within his or her hand. The racquet spin choices are manufacturer's label up or manufacturer's label down. The winner of the racquet spin gets to decide between being the server or the receiver during the first game. The other player or team is usually offered a choice of which side of the tennis net they want to be on for the first game. ​The first point of the game is served from behind the right side of the server's baseline. The server aims diagonally across the net to make the tennis ball land into the receiver's right service box. Note: The right service court is also called the deuce service court. ​The second point of the game is served from behind the left side of the server's baseline. The server aims diagonally across the net to make the tennis ball land into the receiver's left service box. Note: The left service court is also called the ad (advantage) service side. ​Serve and receive of serve positions alternate from right side to left side after each point is played, until a game ends, then the first serve of the next game begins from the right side. 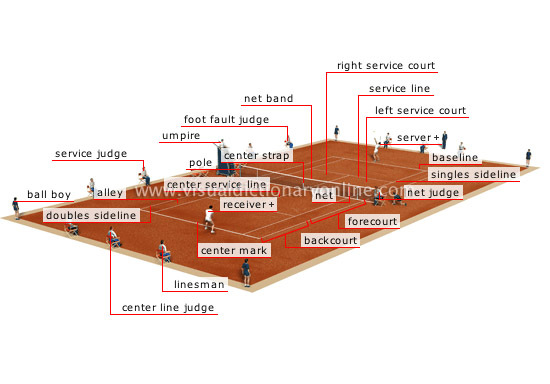 The court above (from Picture Dictionary Online) shows a server and a receiver in positions to serve and receive serve. ​​The server must stand behind the baseline and to the right of the center mark to execute the first service of a game. The center mark separates the allowed service standing positions when serving to the right service court or the left service court. The server aims diagonally across the net to make the tennis ball land in the receiver's service box. Any ball which lands in the appropriate box or touches any part of the line is a good serve. A good serve which touches the top of the net is called a let. A let service must be replayed. The right (deuce) service box is shown. 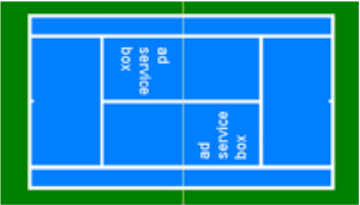 ​A tennis service to the right (deuce) service box requires the server to be standing to the right of the center mark at the center of the baseline. The server aims diagonally across the net to make the tennis ball land in the right service box. Center mark at the center of the baseline. The left (advantage) service box is shown. ​A service to the left service box (ad) requires the server to be standing to the left of the center mark at the center of the baseline. The server aims diagonally across the net to make the tennis ball land in the left service service box. ​​Every good tennis player needs to be equipped with a variety of service types to keep a receiver guessing about which type of service will be used next. ​​The service is the only stroke in tennis which allows a tennis player an opportunity to abort after initiating a stroke, and do a retake. A good ball toss allows a good serve. Do not hit a bad toss. Toss the ball again. ​Tennis players take alternate turns being the server of entire games. The first service of each game is served into the service box on the deuce side of the receiver's half of the court. From the server's point of view, the deuce court service box is located to the server's left. From the receiver's point of view, the deuce court is the right half of the tennis court. The second service of each game is served into the advantage service box. Two service attempts are allowed into each service box. The server alternately serves to the deuce court and then to the ad court until his service game is won or lost. For a flat service, your stance will be such that your feet are positioned near shoulder width apart and the foot opposite your racquet hand is closest to the baseline. ​STEP 1) To find a flat serve stance, extend your arms on either side of your body so that they are parallel to the ground. Stand so that your arms are part of a straight line through your shoulders and your non-dominant hand is extended in the direction you want the tennis service to land. Looking down at your toes, you should notice that a straight line across your toes points in roughly the same direction as the line through your shoulders. ​STEP 2) Now, without changing the location of the very front of your shoes, shift both feet to turn both of your shoulders to face where you want your service to land. Now, you are facing the service box, but a straight line across your toes will still aim toward your service target. Your front foot is aiming near the net post on the side where your dominant hand is holding the tennis racquet. Your back foot is pointing at the sideline somewhere between two to seven feet from the baseline. The ready position is a functional variable. The positioning of your service stance depends on where you want the ball to go and what style of service you plan to use. ​Some of the variables of a service ready position include the hip and shoulder positions (accomplished by adjustments of the feet), tennis ball placement (accomplished by non-dominant hand placement on or near the tennis racquet), and placement of the tennis racquet hand. Adapted variables of the service ready position are made to accommodate specific functions of certain types of serves, or for reasons of personal comfort. The most important part of any service is being able to toss the ball to a proper location for the type of service motion you intend to execute. The service toss is the equivalent of footwork for any other stroke or hit. An accurate ball toss positions the ball correctly according to where the serving shoulder needs to be at the moment of string-to-ball contact. Using an overhand throwing motion, like a baseball pitcher, and the service stance for a flat service (as described above), practice throwing tennis balls toward the top of the opponent's back fence in the direction of the service box. You can practice in a grassy area by throwing an old tennis racquet. Practice a good throwing motion that allows for maximum distance. Practice throwing up and forward. The throwing motion includes a power loop in the back where the elbow is raised and the hand dips to a back-scratch position. The flat service motion is a simple throwing motion. For a flat service (using the stance described above), swing your tennis racquet using a super-slow throwing motion and stop when the racquet strings are facing inside the opponent's service box. Do this a few times and then adjust the position of the center of the stopped racquet (sweet spot) in all directions (left to right, forward and backward, and up and down) until you have outlined a six inch, square, ball toss box; this box represents the approximate limits of a good toss. Do not strike a ball toss which is located outside of the imaginary box you have measured for yourself; another ball toss will be necessary. Note: Use experimentation to find the position of the imaginary ball toss box for various types of serves. Imagine a six inch square ball toss box. ​​Any toss that will let you strike the ball in this imaginary box is a good toss. A ball toss that will not result in the racquet-to-ball contact happening inside your imaginary ball toss box should not be struck. Wait for a good ball toss. Your best serve requires a good toss. The best way to improve the service is to improve the ball toss. 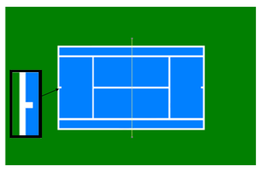 ​The approximate location of your imaginary tennis service ball toss box is directly forward of your ear that is on the side of your head where the ball will be struck, at the approximate height slightly higher than the height that your tennis racquet reached while doing a super-slow motion throwing motion, as described above. Step 1) To begin your actual service motion, aim the tennis racquet and the tennis ball toward the target service box with comfortably outstretched arms. ​Step 2) Let both arms go down together and then up together. The ball hand tosses the ball while the racquet hand executes the service (throwing motion). ​Step 3) Repeat the throwing motion flawlessly and continually fix the ball toss to accommodate the throwing motion. A good toss places the tennis ball into the path of the tennis racquet motion. ​Step 4) Allow the tennis racquet to continue until a full follow through has been completed. ​Step 5) Set up a target and practice serving a tennis ball by adjusting your arm ​pronation (arm rotation to the left or right) until you are able to miss by approximately an equal distance on either side of the target. ​Step 6) Purposely toss the tennis ball outside of the imaginary toss box, on all sides, so that you more clearly understand the result of each bad toss. ​Step 7) Try to execute a good ball toss, but practice making opposite errors for each tossing error that you make. Understanding how to make errors on all sides of a good toss will help you to find a good toss more often. ​​A ball toss too close to the net will likely yield a net serve. Make net errors which hit only the very top of the net. A ball too too far away from the net will likely yield a long service. ​Make long errors which bounce only one time before hitting the back fence. While practicing, toss your ball too far to the left and too far to the right to understand the results of hitting a ball tossed inaccurately from left to right. This experimenting should allow you to make wide errors and begin to formulate corrections with your ball toss. After you are able to successfully serve a flat serve, try adjusting the tennis ball toss location (left, right, forward, back, high, low), your feet and shoulders (left, right), and where the racket starting position (low, high, left, right). Use your imagination. ​Try variable combinations of spin (brush) and hit (flat) to learn multiple ways to serve the tennis ball. Each service toss location variations will need to be matched with service stance variations to allow the ball to travel to a desired landing location. ​The severity and angle of the brushing motion against the ball will dictate where the ball needs to be tossed. Experiment with high and low tosses. Use a tossing location above your ear, on the racquet side of your head, as a starting point and vary from there to find what is possible. Adjust the brushing motion angles and initial contact points on the ball to make necessary changes for errors made.